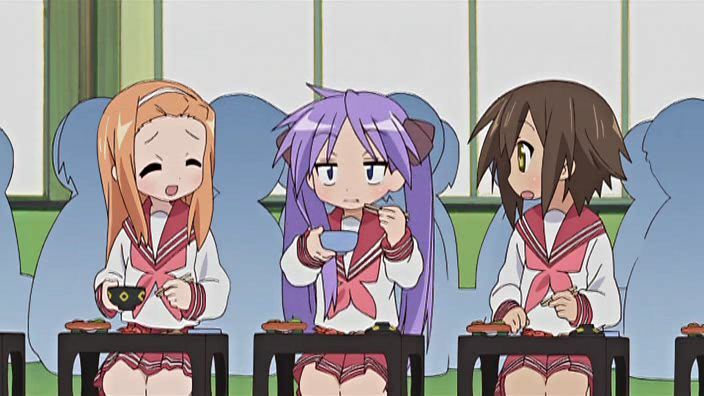 Well, we’re coming up on the 24th and final episode of Lucky Star as far as we know, and it’s been interesting. They haven’t changed their formula of humor from episode 1 (which probably disappointed some fans), but if you didn’t mind that, the show was a fun watch. I guess my only gripe with the series was the fact that though we learned more about some characters, we didn’t really get to know them as more than the 1-D characters that they were at the start of the series. Exceptions include Kuroi-sensei, Misao (behold the power of the fang), and of course Kagamin. It was a show about nothing, and yet after 23 episodes, I’m surprised that the series is almost over. It still seems like they had only just debuted the last cast of characters and we only started to get to know them. And while the humor was hit and miss and the transitions were never quite there through out the run, I wouldn’t mind watching 24 more episodes. Seriously. In episode 5 (I think), why does depleted uranium fit into Tsukasa’s phone conversation so well? In the episode with the bath scene (episode 6? ), did anyone else find weird the conversation between Tsukasa and Kagami when they were talking about their father’s “thing”? What do you think of Soujirou’s relationship with Konata (how she got to be who she is today, how he acts around her now, and so on)? What was your favorite karaoke ED theme? 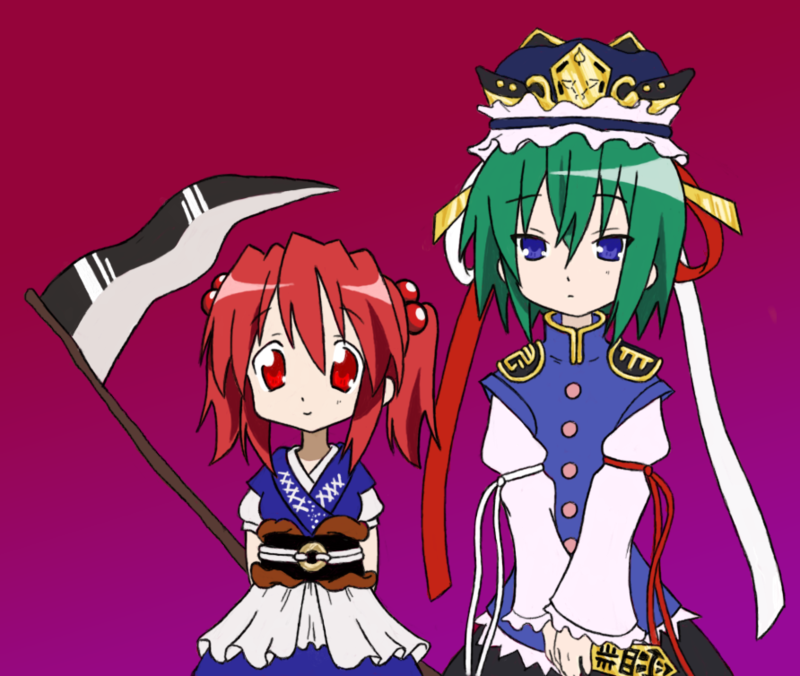 (For me, a toss up between Konata’s rousing CHA-LA-HEAD-CHA-LA and Miyuki’s manly Chijou no Hoshi). Why was there so much shameless product placement in the show? For American fans: Does Patty’s views (which might be a reflection of what the Japanese think of American otaku) make you feel proud to be an anime fan? Is there any significance in the flags (shown under this question) that Yutaka is holding in episode 17 during the set up to Konata’s birthday party? How often could you relate to the situations that we’re presented throughout the show, from conversations about what’s being eaten to getting attacked by deer? If Soujirou wins at life, how much does he win by? Why didn’t Lucky Channel Minoru grow a pair earlier? Would’ve saved a lot of heartbreak. What if, in a funny twist of fate, Miyuki grew up to become a dentist? Why doesn’t Ayane get mad, from what Misao said? It seems like it would be made of much hilarity. Was anyone else tired of the comparisons between Lucky Star and Azumanga Daioh? Is the latter really a paragon of slice of life school comedy anime? Was 24 episodes too long or short of the show? Lucky Channel? Why did you continue watching the series? Or for people who stopped watching, why did you stop? Did the homage to 24 in episode 17 need more or less Jack Bauer? 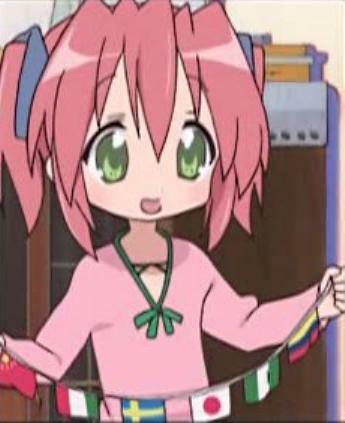 me encantan las imagenes de lucky star que has puesto ademas la ultima pero la que esta con minami la del pelo verde la pelirroja que esta con minami tiene que tener los ojos verdes no rojos y en la ultima minami la del pelo verde que es minami la as dibujado bien.